Georgia Urology is a proud sponsor of the upcoming 2016 Bottoms Up 5K presented by legendary Atlanta Braves outfielder, Brian Jordan. The 5K will be held at the Chateau Élan Winery & Resort on October 22nd, 2016. Not only will the participants in the 5K run through the grounds of Chateau Élan, but they are also invited to a wine tasting at the finish line along with education sessions on men’s health. The Bottoms Up 5K will benefit ProstAware, a Georgia-based non-profit 501(c)3 organization that promotes prostate cancer awareness through music, technology and sports. The founder and president of this organization is Dr. Scott Miller, a Georgia Urology physician. Dr. Miller finds that his values align with Brian Jordan when it comes to men’s health awareness. Brian Jordan’s father, Alvin, passed away due to prostate cancer in early 2014. Since then, Jordan wants to encourage men throughout the state to place importance on their health and wellness. 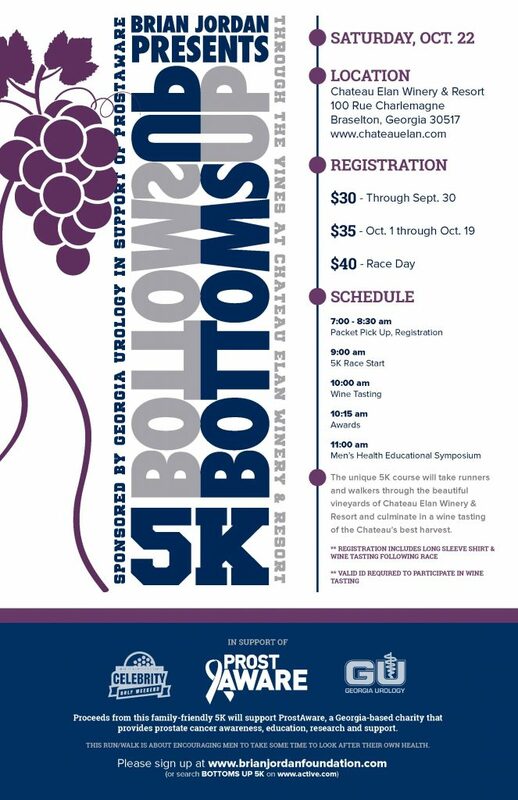 Georgia Urology is honored to help Jordan in reaching this goal by supporting this year’s Bottoms Up 5K. Participants in the 5K can register and pick up their runner’s packets from 7:00 a.m. to 8:30 a.m. at Chateau Élan Winery & Resort located at 100 Rue Charlemagne, Braselton, Georgia 30517. The race will begin at 9:00 a.m. followed by a 10:00 a.m. wine tasting. Awards for the race will be given at 10:15 a.m. followed by a symposium on men’s health at 11:00 a.m. Those interested in running in the Bottoms Up 5K can register online here.